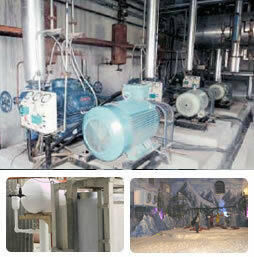 Frick India can provide cooling of the oil in order to convert them in vanaspati. We can provide the cooling system that converts oil from 55 deg C to 17 deg C by means of Fast chilling as well as normal chilling process as per the requirement of the customer. Frick India can provide you ice making system at your site, which can be used in storage of marine products, continuousconcrete mixing at various constructions and making ice forice skating rinks.